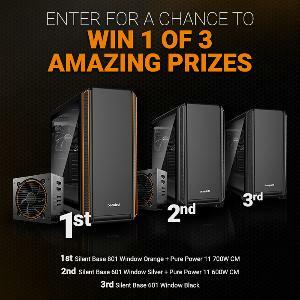 Prize: For our first prize we have a Silent Base 801 chassis and a Pure Power 11 700W PSU. Our runner-up will bag a Silent Base 601 chassis and a Pure Power 11 600W power supply, and we have another Silent Base 601 for third place. Statistics: This contest was opened by 140 and entered by 11 ContestChest.com members. 8% of those who opened the contest, entered it.